A fact: A fact is a truth. A fact is a statement of truth that can be verified and is able to be proven as true. An opinion: An opinion is a statement that reflects an author's or the speaker's point of view, beliefs, perspective, personal feelings and values; opinions cannot be verified and proven to be true or false like a fact can be verified and proven to be true; however, a person's opinion can be supported or refuted when a critical thinker and a critically thinking reader of a text scrutinizes and critically evaluates the author's opinions, point of view, beliefs, perspective, personal feelings and values and these opinions are based on documented valid and reliable facts. Empirical data and information: Evidence of a fact that entails and includes the use of one's five senses. 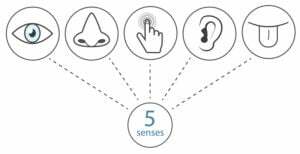 The five senses: Vision, hearing, smelling, which is referred to as the olfactory sense, tasting, which is referred to as the gustatory sense, and the sense of touch, which is the tactile sense. 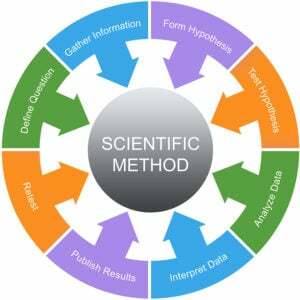 The scientific method and scientific inquiry: The scientific method and scientific inquiry include a hypothesis or hypotheses which seek to find out about the relationships between and among the variables under study when a research study is being conducted. A null hypothesis: A null hypothesis is accepted when the research does not accept or refute the research hypothesis. A bias: A bias, simply defined, is the tendency of a human being to have a positive tendency, inclination or proclivity for something or a negative tendency against something. Other words that describe a bias are a predilection, an inclination, a preference, and a prejudgment for or against something. Group think bias: This bias occurs when members of a group want high levels of cohesiveness, consecutiveness, agreement and harmony within the group and they do not want a lack of harmony and conflict. The tendency for group think occurs as a part of human nature. Conformation bias: This bias, simply stated, is a person's predilection and tendency to support, favor and accept thoughts and things that are consistent and congruent with their preexisting thoughts, beliefs and opinions. Overconfidence bias: This bias is manifested when a person is biased towards their own perspective and view because they believe that they and they alone is the expert. The halo effect bias: This bias is characterized with a person's inclination to blindly accept the thoughts, views and perspectives of another person, including an author of a text, because of some characteristic or trait of that person even though that person's traits and characteristics have little or nothing to do with the perceived expertise that a person thinks that they have. The horn effect bias: The opposite of the halo effect of bias is the horn effect of bias. This bias is characterized with a person's inclination to blindly reject the thoughts, views and perspectives of another person, including an author of a text, because of some characteristic or trait of that person even though that person's traits and characteristics have little or nothing to do with the lack of expertise that a person thinks that they have. Simply stated, a fact is a truth. A fact is a statement of truth that can be verified and is able to be proven as true. An opinion, in contrast to a fact, is a statement that reflects an author's or the speaker's point of view, beliefs, perspective, personal feelings and values; opinions cannot be verified and proven to be true or false like a fact can be verified and proven to be true; however, a person's opinion can be supported or refuted when a critical thinker and a critically thinking reader of a text scrutinizes and critically evaluates the author's opinions, point of view, beliefs, perspective, personal feelings and values and these opinions are based on documented valid and reliable facts. Opinions can be accurate and true but opinions can also be completely false and untrue. In other words, an opinion can be a fact when it is accurate, true, and verifiable with evidence. In addition to these differences between a fact and an opinion, facts are objective and opinions are subjective; facts are consistently repeatable in terms of their measurement and observation with empirical senses, and, opinions are not repeatable in terms of their measurement and observation with empirical senses. Empirical data and information, which can be used as evidence of a fact, include the use of one's five senses. The five senses are vision, hearing, smelling, which is referred to as the olfactory sense, tasting, which is referred to as the gustatory sense, and the sense of touch, which is the tactile sense. For example, empirical data and information is collected when we can establish the time of day by looking at a reliable and valid time instrument and seeing the time with our eyes; when we can verify and determine that thunder is clapping because we hear this clapping with our ears and our auditory senses; when we can determine that something is hot because we can feel it with our fingers and our tactile, or touch, senses; when we can determine that something is bitter and sour because we can taste it with our taste buds in our mouth and we use our sense of taste, or gustatory senses; and, we can also determine that an odor is noxious because when we use our nose, our olfactory senses and our olfactory nerves to smell things and identify odors according to their characteristics. In summary, empirical data and information is data and information that can be proven and verified with our five senses which are the sense of sight, or vision and/or the sense of hearing or auditory sensation and/or the sense of taste, or the gustatory sense and/or the sense touch, or the tactile sense and/or the sense smell, or the olfactory sense. As shown in the diagram above, the scientific method and scientific inquiry include a hypothesis or hypotheses which seek to find out about the relationships between and among the variables under study when the research study is being conducted. For example, a researcher may state that "The pulse rates of patients who will be getting open heart surgery will increase according to the amount of fear and stress that they are experiencing as a result of this pending invasive surgery." A research study will NOT prove that the hypothesis is true or false. Research will only support the hypothesis or refute a hypothesis. A hypothesis, or educated guess, is supported when the rigors of scientific inquiry and statistical analysis indicate that the hypothesis can be upheld and accepted. On the other hand, a hypothesis is rejected when the rigors of scientific inquiry and statistical analysis fail to indicate that the hypothesis can be upheld and accepted. Lastly, a null hypothesis is accepted when the hypothesis can neither be supported nor refuted; the null hypothesis, therefore, is accepted when the hypothesis CANNOT be upheld and it CANNOT be rejected. As stated above, a hypothesis can be neither proven to be true of proven to be false. A hypothesis can simply be supported or rejected with the research project. Based on the limitations of a hypothesis, research does not conclude with a theory or facts. Theories are developed over time when repeated valid and relatable research is done and there is finally a consensus and agreement among scientists that a theory is valid and then a fact does exist. As mentioned above, an opinion, in contrast to a fact, is a statement that reflects an author's or the speaker's point of view, beliefs, personal feelings and values; opinions cannot be verified and proven to be true unless, of course, these opinions are based on facts and evidence. Opinions can be true and valid but opinions can also be completely invalid, false and untrue. In other words, a valid opinion is a valid one when the perspective, the point of view, the personal beliefs, and/or personal feelings are based on a facts and when the data and information that this opinion is based on is accurate, true, and verifiable with evidence. In addition to these differences between a fact and an opinion, facts are objective and opinions are subjective; facts are consistently repeatable in terms of their measurement and observation with empirical senses and opinions are not repeatable in terms of their measurement and observation with empirical senses. Research has indicated that a person's pulse rate, blood pressure and respiratory rate increase when the person is under stress. All people, therefore, should do stress management techniques on a daily basis. The Fact: The fact in the above statement is "a person's pulse rate, blood pressure and respiratory rate increase when the person is under stress " and the opinion in the above statement is "All people, therefore, should do stress management techniques on a daily basis." This fact has undergone the rigors of scientific research, it is objective, it is verifiable, and it has been proven to be true with research and empirical evidence and the use of empirical senses. For example, the person's pulse can be felt with the tactile sense, the blood pressure of the person can be accurately measured with the sense of vision while looking at the blood pressure machine and the person's respiratory rate can be counted while observing the person's chest rise and fall with each respiration which uses thee empirical sense of vision. Additionally, levels of stress can also be empirically verified and proven to be true. The Opinion: The opinion statement, in contrast to the factual statement in the reading passage above, is not verifiable and not able to be proven true with empirical evidence and the use of our empirical senses. This statement is a subjective statement; it is not repeatable or replicable terms of measurement and observation with empirical senses. Cigarette smoking causes bodily and health problems such as lung cancer and premature infants. It is clear and obvious that only stupid and ignorant people smoke cigarettes. The Fact: The fact in the above statement is "Cigarette smoking causes bodily and health problems such as lung cancer and premature infants" and the opinion in the above statement is "It is clear and obvious that only stupid and ignorant people smoke cigarettes." This fact has undergone the rigors of repeated scientific research over time, it is objective, it is verifiable, and it has been proven to be true with research and empirical evidence and the use of empirical senses. A bias, simply defined, is the tendency of a human being to have a positive tendency, inclination or proclivity for something or a negative tendency against something. Other words that describe a bias are a predilection, an inclination, a preference, and a prejudgment for or against something. A bias can lead to a prejudice and a prejudice can lead to a stereotyping. Biases can be detrimental and not helpful to judgement and sound decision making; biases can lead to poor judgment, poor reasoning skills, and faulty decision making because they may close the person's mind off to alternative ideas, truths and opinions. Personal biases are subliminal and unconscious. For this reason, authors and critical readers must be aware of the fact that they are often not under the automatic conscious control of the person. In order to avoid the obstacles that result from bias and to restore objective, impartial and critical thinking skills, a person should self reflect and strive to identify any personal biases that they may have. Then, the person should consciously strive to eliminate, or at least decrease, any bias that is being injected into their writings, as an author, and that is being injected into one's reading and their interpretations of the material that is in the reading material. Group think bias occurs when members of a group want high levels of cohesiveness, consecutiveness, agreement and harmony within the group and they do not want a lack of harmony and conflict. The tendency for group think occurs as a part of human nature that strives for belonging and harmony and that also strives to avoid aloneness and conflict. Group think bias, like the other types of bias, impede good judgements and decision making; it also serves as a barrier to creative and divergent thinking which can be highly beneficial in terms of judgment and decision making in terms of complex problem solving. Conformation bias, simply stated, is a person's predilection and tendency to support, favor and accept thoughts and things that are consistent and congruent with their preexisting thoughts, beliefs and opinions. Again, human nature plays into a person's use of conformation bias. Human nature tends to reject new thoughts and new things; human beings tend to strive to maintain the status quo even when valid and reliable evidence suggests otherwise. For example, a person is more comfortable and accepting of their belief that the gun violence in schools is caused by poor parenting and poor parental discipline rather than multiple other factors such as mental illness and accessibility to military type weapons, even when there is clear, unambiguous scientific evidence that supports these impacting factors. Overconfidence bias is manifested when a person is biased towards their own perspective and view because they believe that they and they alone is the expert. These people with overconfidence bias overestimate their knowledge, they present their thoughts with certainty even when, in reality, these thoughts are erroneous, and they reject the thoughts and ideas of others even when the thoughts and ideas of others are based on facts and evidence. In the vernacular, a person with overconfident bias is a "know it all". The halo effect bias is characterized with a person's inclination to blindly accept the thoughts, views and perspectives of another person, including an author of a text, because of some characteristic or trait of that person even though that person's traits and characteristics have little or nothing to do with the perceived expertise that a person thinks that they have. Research has indicated that people with a tall stature, a vibrant personality, high levels of attractiveness, a high level of intelligence, advanced education and the male gender are viewed as experts by others when the halo effect is being used by those people. The opposite of the halo effect of bias is the horn effect of bias. Research has also indicated that people with a short stature, a dull personality, low levels of attractiveness, a low level of intelligence, poor education and the female gender are not accepted by others and these people are also not viewed as experts by others when the horn effect is being used by those people. Regardless of the type of bias that a person has, all critical readers must be aware of the fact that they have biases which can, and will, adversely affect their comprehension of a reading passage when the thoughts and ideas in the reading passage are not consistent with their own biased thoughts and ideas of the reading passage; and rather than their own thoughts and ideas. Likewise, all authors must recognize and tackle their own biases so that a factual piece of writing that should be objective is not contaminated by the often subconscious personal biases. Identifying the author's "facts" as the author puts forward in the reading passage and determining that these "facts" are not facts because they are not objective, they cannot be backed up with evidence and they are not replicable and repeatable at all times. As stated above, a bias can lead to a prejudice and a prejudice can lead to a stereotyping. Biases, at times, can be helpful in terms of a person's judgment and decision making and, at other times, a bias can be detrimental and not helpful; biases can lead to poor judgment, poor reasoning skills, and faulty decision making. Stereotyping can be even more detrimental than biases in terms of judgments and decision making. Simply stated, a stereotype is an oversimplified generalization that universally makes all people or one thing that shares even a single characteristic as all the same. In addition to the fact that stereotyped people and things are inaccurate, they can lead to unfair, unjust, and even hostile behaviors towards others. For example, the picture above shows the stereotyping women as horrible and dangerous drives. If for example, a police officer pulls a woman over for speeding and they hold this stereotype to be true, they will more likely give the speeding ticket to this woman, rather than a man who has violated the speed limit at the identical speed. The most dangerous, and often illegal, consequence of stereotyping is discrimination and inappropriate responses to and actions against an innocent person as the result of their discrimination. Males are far better leaders and administrators than women. The elderly are nonproductive and useless. Severely ill newborns should not be given treatment because they will not survive a normal life. All children are addicted to video games and their devices. The Jewish religion is the only legitimate religion. White supremacy is the only way to save the human race. Black people are ignorant and lazy. Italians are all in the mafia. Germans are cruel and uncaring. The Japanese are great golfers. Acknowledging the fact that few, if any things, are ALWAYS true or ALWAYS false; therefore, stereotypes that claim that ALL people or NO people are rarely if ever true.